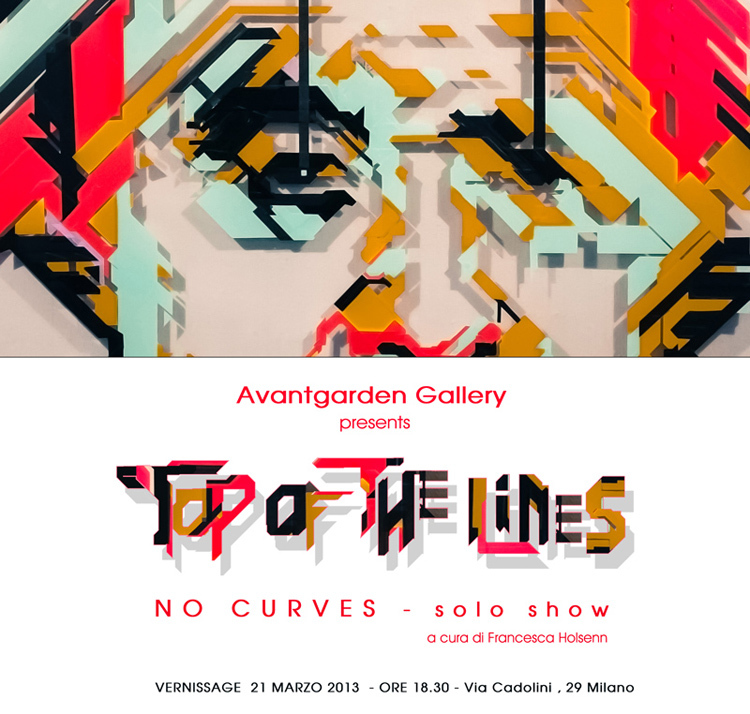 AVANTGARDEN, gallery sited in Milan that keeps en eye on selecting the best from international underground art, has chosen NO CURVES, among the most innovative artists on the Italian scene, to organize a solo exhibition which deeply explores his planning stage. NO CURVES, as designer, questions himself about the origin of ‘the idea’ and, as artist, about the representation of the creative process. 10 are the talents in the pantheon of NO CURVES: Fabio Novembre, Philippe Starck, Stanley Kubrick, Giò Ponti, Antoni Gaudì, Katsuhiro Ōtomo, Bruno Munari, Ettore Sottsass, Fortunato Depero e Le Corbusier. 10 souls of designers that NO CURVES put under his lens, creative minds whose philosophy and line of thought have been investigated by the artist, looking for clues, connecting concepts and images that materialize the passage from the idea to the creation. Lines and color synthetize the connections among inspiration, philosophy, project and product in order to become work of art. The technique of adhesive tape leads the image to the strictest terms, and the lines intermingle, collide, and overlap, becoming the somatic traits of the characters but also symbol of the neural and synaptic connections at the basis of the art of ‘creating’. But, where does ‘the idea’ come from? The line of NO CURVES gets out from the exposed artworks and enters as guide into the artist’s intimacy, in his studio, among his things, in the place where he collected the clues that then followed, making us part of his personal creative process. At ‘TOP OF THE LINES’ will be also displayed “Adam & Eve” (2007) and “I’m young, I’m old, I’m dead” (2010), for which NO CURVES was chosen among the finalists of the 2010 Cairo Award.